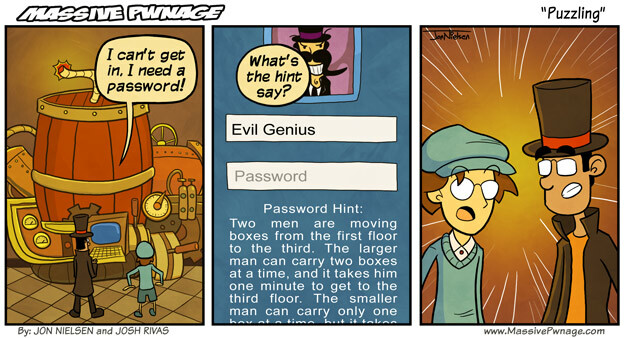 I played the first Professor Layton briefly, but the constant barrage of puzzles just wasn’t for me. I’ve decided to play the newest game in the series becuase of Locke’s frequent proclamations of love for Professor Layton and his puzzles. I like this one more because the puzzles feel more relevant to what you’re trying to do. Someone asked me to fix a clock, springing me into a puzzle where I had to place a gear in the proper place. Of course, being a puzzle game, solving puzzles is the only way to accomplish anything. I went to enter a shop, but when I tried to open the door I was presented with a puzzle. When I finally entered, the shop owner told me that they never have any customers. This entry was posted on Friday, September 17th, 2010 at 12:00 am and is filed under Comics. You can follow any responses to this entry through the RSS 2.0 feed. Both comments and pings are currently closed. i would ragequit after about 5 minutes of playing that game. I wonder why, frickin lock your door on your shop. Yeah, the Ace Attourney series is awesome.